Dolly - Needs Foster needs a caretaker or foster! Won't you consider helping her get a new start? 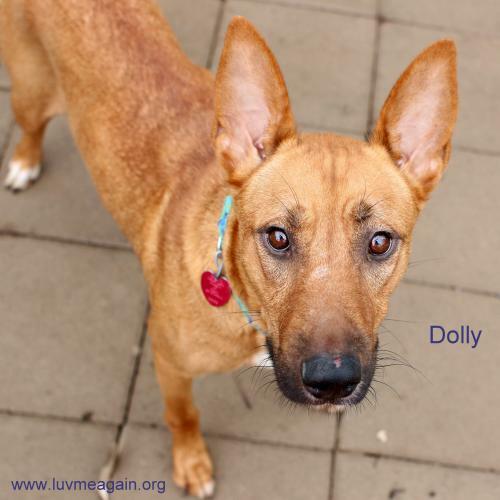 Print an adoption flyer for Dolly - Needs Foster! About Me: Up until February of 2016, I was a stray on the streets. Some people knew me, and they would offer me food on occasion. Sadly, I became pregnant and animal control finally caught me when I had my puppies. My puppies and I all came to rescue, where we are learning what it means to be family pets. I am still timid indoors and still very scared of the leash, but I do want to learn. My forever family will need to be patient with me while I learn all these new rules and routines. Since I came in with puppies, the nice rescue is giving me some time to settle in and get to feeling my best before checking out my manners (how I do in new situations, around dogs and kids, etc). Currently we do not know if Dolly - Needs Foster will be able to attend the event, Adoption Event on Sunday, April 17th, 2016. Currently we do not know if Dolly - Needs Foster will be able to attend the event, Adoption Event on Sunday, May 1st, 2016. See Dolly - Needs Foster's attendance information for future events.